Desperately men seek happiness. The majority understand that happiness is found in love. But today the word "love" is losing its very essence. Along with man himself, love is losing its identity and doesn't bring the fulfillment that is expected of it. Perhaps because love has been equated with lust, with encounters that barely touch the hearts of those who casually have met and as casually have parted. Yes, men seek for happiness and dimly know that love is happiness, but somehow or other have lost the true meaning of love and they are going around and about seeking it or seeking someone who can tell them where it is to be found. One person who can direct mankind to love is Mary, the Mother of God. Because she became pregnant with Love and she brought forth the Christ; the Tremendous Lover of man! To bear Love. To bring Love up, when Love takes the shape of a Child. To watch Love grow to manhood. To follow Love at a distance, yet being always bound to it, and finally to stand under Love's supreme sacrifice, the death of Love, (it was her Son), is to know the way of Love! Not only to know it intimately, deeply, and profoundly, but such knowledge becomes like a fire in one's soul. It cant be kept within one's heart for oneself alone. It must be given to others. Of all the people on this earth, of all the creatures that really wanted to give humanity the way to this Love, Mary is the door through which Love passed and became a Child. To go to Mary, as you and I would go to a beloved neighbour's house, to sit down in her kitchen, and to ask her to tell us about Love and the way to it, is the simplest thing in the world! For faith spans time and enters into eternity, and to a Christian the Communion of Saints is a reality, for those who have died are with us, and we are with them, united in the immense bond of Love that is the Lord. And so talking to Mary should be very simple. Many have found the way easily. More should try it. 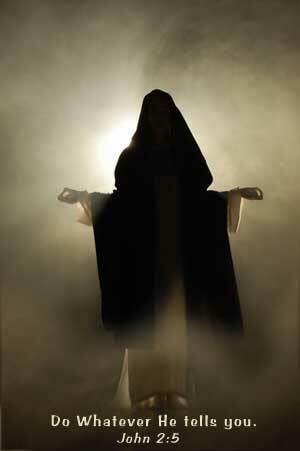 She will tell you about her Son who took upon himself your pain and my pain – your sin and my sin. She will tell you about the deep, strange, fantastic obedience he had to his Father, and we will know what obedience truly is, and how to pave the way to Love. She will explain that in order to be fulfilled and find one's identity, one has to drop the pronoun "I" and live by a total attention, by constant listening to the other – to him, to her – the other. She will explain that no one should really do "their thing" selfishly, but should open one's heart and embrace "all things" that the other does that are good and helpful to everyone. Lastly, she will speak in a low voice about her own fiat which simply means "yes" to God. And if Christians listen carefully to the gentle voice of the mother of Jesus, they will know what that "yes" means to their life. They will know what Love is and having found it they will never let it go. So let us turn to a woman who truly can liberate us. Let's do it now! Catherine Doherty (August 15, 1896 – December 14, 1985), born in Russia, was foundress of Madonna House and a prolific writer and teacher. Her passionate zeal impelled her to pass on her faith in God, and she is now being considered for sainthood by the Catholic Church. Visit www.CatherineDoherty.org for more information.